Working to create family-friendly connections through and along the new SR-520 project area in order to connect Capitol Hill and the surrounding neighborhoods. Last night, several members of Central Seattle Greenways and other Seattle Neighborhood Greenways groups attended a meeting in the Montlake Community Center on the Portage Bay Bridge section of the 520 bridge replacement program. 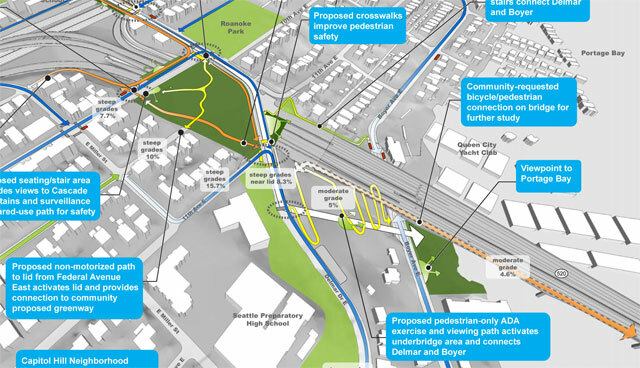 We checked in with WSDOT to see what changes will be coming to our inter-neighborhood connections at the north end of Capitol Hill, and provide feedback on their proposals for active transportation facilities on the 520 lids and the Portage Bay Bridge. As a greenways advocate, three connections stood out as being especially important in the new renderings and designs of the Roanoke area and the Delmar Lid, which will be between 10th Avenue East and Delmar Drive East. A bike/pedestrian connection on the Portage Bay Bridge, a new connection between Delmar Drive East and Boyer Ave E, and a link over I-5 on E Roanoke.